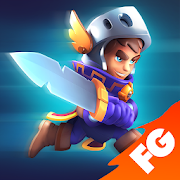 Kopla Games created an enjoyable idle RPG called Nonstop Knight, and it was published on the Play Store all the way back in 2016 by Flaregames. Over the last three years, the title has amassed over five million installs on the Play Store and over fifteen million installs across multiple marketplaces. Well, it would appear the devs have a new project on the horizon, and it's a direct sequel to Nonstop Knight. Today Flaregames and Kopla Games have announced that Nonstop Knight 2 will be coming to Android in 2019. Details are still light. An exact release date is unknown past the 2019 placeholder given today, and there is no news about the type of monetization we should expect. What we do know is that this sequel will build upon the original's blend of action RPG and idle gaming. The one-touch gameplay will remain intact for the most part, though supposedly there will also be some new features in the mix that affords the RPG gameplay an even more authentic feel over the previous release. The progression system has been overhauled, and a social component has been added to the gameplay in order to increases the impact and depth of the game's loot, whatever that means. While announcements like this don't really serve much of a purpose past building hype in the community, I'm sure there's more than a few readers out there that will be happy to hear a sequel to Nonstop Knight is coming sometime this year. It would seem the original release has been suffering from some crashing issues over the last month, so a sequel might not be that crazy of an idea when the original is starting to falter. So here's hoping Kopla Games can pull it together to come up with another enjoyable idle RPG for the fans of the original.